A patient, who recently underwent cholecystectomy and ERCP due to gallstones in the the gallbladder and the hepatic duct, had persitently elevated liver function tests. Therefore, MRCP was requested. 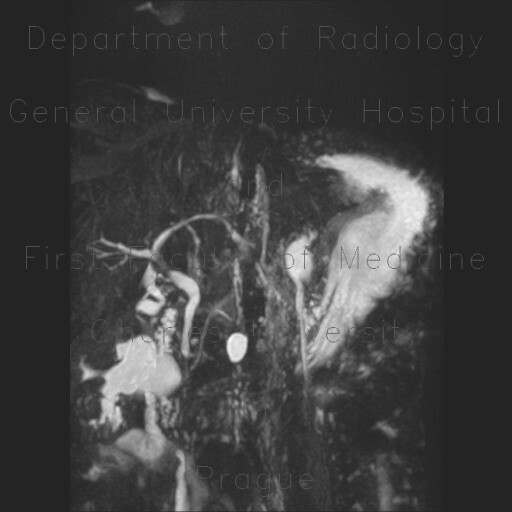 It showed a stenotic segment involving most of the common hepatic duct between the stump of the cystic duct and the bifurcation. The stenosis has smooth edges and the dilatation of the intrahepatic biliary ducts is almost non-existent indicating a benign nature of the stenosis. A non-comunicating cyst (well-defined and high signal intensity) in the head of pancreas is a secondary finding.